When you picture pollution, images of smoke stacks and vehicle exhaust probably come to mind. However, according to the Environmental Protection Agency, indoor air quality is often several times worse than outdoor air, even in the most polluted city. Here’s how to prevent indoor air pollution in your Longview home so you can breathe easier this winter. One reason indoor air quality suffers today is because of the obsession with creating more energy-efficient homes. While the goal to save money on energy bills is commendable, living in an airtight home can have a negative impact on indoor air quality. Instead of surrendering to higher energy bills by opening the windows on cold days for a rush of fresh air, use ventilation when appropriate. For example, run the kitchen and bathroom exhaust fans when cooking or cleaning. If you’re repainting the bedroom, block off the room and open the window to dissipate the fumes. You can even have a whole-house ventilation system installed. This systematically replaces the air in your home with fresh outdoor air while preheating it on its way in. This prevents energy bills from getting out of hand while introducing much-needed fresh air to the space. Some pollutants are obvious because of the smells they give off, but others are more clandestine. Take radon for example. This radioactive gas rises up from the ground, entering your home through the basement. Radon is the second leading cause of lung cancer. You can’t smell it, but you can check for it with an inexpensive testing kit. If you discover high levels, speak with a contractor about installing pipes to divert rising radon. Another example is carbon monoxide, a tasteless, odorless, invisible gas resulting from incomplete combustion. All fossil fuel-burning appliances give off carbon monoxide, but under normal conditions, it’s vented safely outside. To ensure this remains the case, install carbon monoxide detectors in your home to alert you of a potentially deadly leak. The most common chemicals used indoors are household cleaners. Switch to natural cleaning products that don’t use chemicals to get the job done. When harsh cleaning agents are necessary, use them sparingly and run an exhaust fan or open a window to ventilate the space. You might not think of them, but items such as air fresheners, candles, aerosol sprays, paint and strong adhesives introduce chemicals into the air as well. These chemicals are called volatile organic compounds (VOCs). To lessen your exposure to them at home, look for labels that indicate the product is low or no VOC. The filter that came with your furnace isn't designed to prevent indoor air pollution. All it does is trap dust, dirt, hair and other large particles with the purpose of protecting the furnace blower from this debris. Large particles are rarely the source of respiratory problems. What you need is an air filter with a higher minimum efficiency reporting value (MERV) rating. The higher the number, the smaller the particles it can trap. To balance cost and filtering efficiency, aim for MERV 7 or 8. Anything that exceeds 12 on the MERV scale is likely too dense for residential applications. 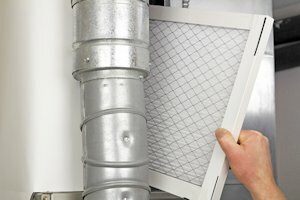 To counteract airflow restrictions and maintain proper furnace function, you may need to have the furnace blower motor adjusted if you install a filter with a denser weave. A higher-efficiency filter is a great place to start, but to prevent indoor air pollution from irritating sensitive individuals, you should consider an electronic air cleaner. These come in many forms. One popular option is a portable unit you can run in the bedroom. For whole-house air cleaning capabilities, replace the furnace filter with a professionally installed air cleaner. This type of unit extracts up to 30 times as much dust and debris as media filters. This could make a huge difference for people with severe allergies or asthma. Potted English ivy, Boston fern, spider plant, areca palm and peace lily are natural air filters. These varieties in particular are capable of removing toxins, such as formaldehyde, benzene, xylene and other VOCs. They don’t require electricity to operate, nor do they look out of place in your home. To enjoy noticeably cleaner air, place two plants per 100 square feet. If you like these tips to prevent indoor air pollution, contact JD’s A/C in Longview for more useful indoor air quality tips. Adequate Ventilation Is Key to a Healthy HomeWhy Has My Heat Pump Frosted Over?